I painted my nails with this Claires neon yellow I got recently. It looks like a normal neon but as I was painting I noticed a very subtle silver shimmer. I like it, it gives it a little extra glow. As I was looking at my hands while the final coat dried I envisioned dots, stripes, even a brick pattern (the polish name is Yellow Brick Road). Then it hit me, it looks like Charlie Browns shirt! He wears black shorts and I debated painting my tips black but I liked it with just the zig-zag. That is so cute, I can't believe it! The claire's yellow is really pretty. Magnolia, thank you! I just came home from the mall and swatched a polish over some nails aaah bye bye charlie brown. Olivia C. - thank you! Love that manicure. Very cute. 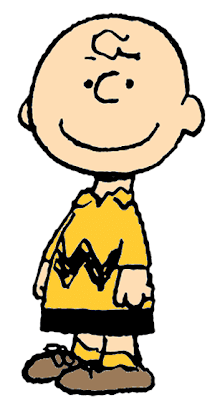 I love Charlie Brown. 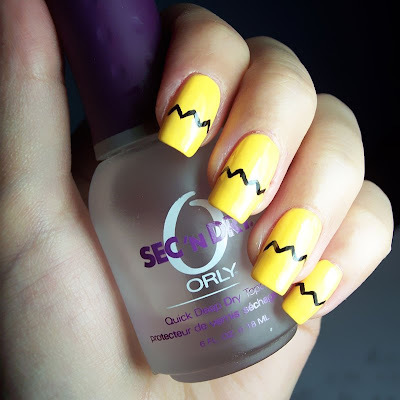 Love this yellow and your nail art is so fun! Great idea! Lucy, thanks. I used to watch Charlie Brown all the time growing up! clockwork, thank you so much! Alexyndra, thanks this is the only yellow I own but I like it too!